Sanitary bins disposal is an essential part of any female restroom. Impact Hygiene understands this delicate need and provides a clean, sleek and convenient solution for female sanitary disposal. Our sanitary units come in a white colour and are regularly serviced to meet the demands of your business. Our sanitary units are covered with germicidal disinfectant, which cuts the risk of cross-contamination and mitigates unpleasant odour. A slim manually operated sanitary bin that is shaped to fit alongside the toilet in any cubicle for convenience. It is designed with a privacy lid. 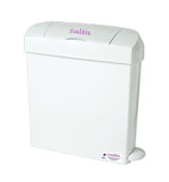 A fully automated electronic sanitary unit that comes with self-opening lids that minimise contact with the bin itself. Not only is it designed to look clean and simple, but it is also user-friendly. The automated model is more popular among women as they prefer not to touch the sanitary bins.